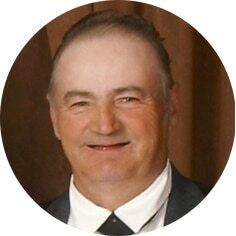 Rodney Wayne Drake, aged 67 years of Moose Jaw, SK passed away on Sunday, January 20th, 2019. He was born in Moose Jaw on August 23rd, 1951 and was the youngest of thirteen children born to William and Chelta. Rod attended Westmount School. Following school, he worked alongside family on the farm. On May 22nd, 1976 Rod married Margie Kae Hill. They lived in Moose Jaw where they started a family with the birth of their sons, Jonathan (April 30th, 1977) and Kent (June 15th, 1978). Rod and Margie moved with their family to the Baildon District in 1980. It was there that they welcomed their third child Michelle on April 24th, 1986. Rodney enjoyed Team Roping at local events until his sons were old enough to rope themselves, at which time he stepped aside and took pride in helping them with the fundamentals of the sport. He was always willing to drop what he was doing to help out a neighbour, friend or brother when they needed help with a project. Rod spent the majority of his working career with the City of Moose Jaw, where he retired after 40 years of service. He was predeceased by his wife, Margie; parents, William and Chelta; brothers: Bernie, Donald, Robert, Dale and Laverne; and sisters: Shirley, Eunice and Kae. Rodney will be lovingly remembered by his sons, Jonathan (Kelley) and Kent (Kara); daughter, Michelle (Lawrence); grandchildren: Easton, Edge, Kavis, Kollins, Raymond, Eva and Leroy; brother, Larry; and sisters: Lorraine, Jeanette and Helen. The Funeral Service will be held on Friday, January 25th, 2019 at 1:30 p.m. in Moose Jaw Funeral Home. Arrangements are entrusted to Moose Jaw Funeral Home, 268 Mulberry Lane. Calvin Gammel, Funeral Director 306-693-4550. Our most sincere condolences to the Entire DRAKE Families in the passing of Rod. To Jonathan, Kent, Michelle and families, we are so saddened to hear of Rod’s passing. We are away from Moose Jaw at this time and will not be able to make the funeral but please know that our thoughts are with you. I have known Rodney since we were kids.Deepest sympathy to the whole family.It is not right that he is gone so young.He sure will be missed. Thoughts and prayers to all of you at this time of sorrow. Bob and I would like to send our deepest condolences to you all on the passing of Rod. I knew Rod from way back in the gymkhana days as kids and Bob and I worked with him for many years. He was always a friend to us. sending our thoughts and condolences. Rod was such a friendly with lots of chuckles guy. will sure be missed. we have great memories of Rod bringing the kids over and having fun on the roping dummy. And through the horses. Always the supporting and proud dad. Jonathan, Kent, Michelle and families – thinking of you all at this sad time. Take care. Sending our deepest condolences to Jonathan, Kent, Michelle and your families.